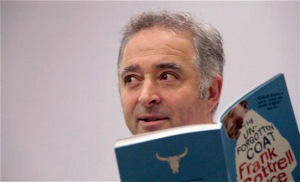 Award winning author, screenwriter and The Reader Organisation patron Frank Cottrell Boyce is appearing at Leasowe Library this weekend for a very special event, rescheduled from last November. To celebrate the donation to the library of new books purchased through a grant from the Siobhan Dowd Trust, Frank will be talking about the books he has written – including Millions, Framed and Cosmic – signing copies, answering questions and sharing stories about his own childhood reading experiences. The event is organised by Leasowe Reading and Wellbeing Library, a collaboration between Wirral Council and The Reader Organisation which promotes public engagement, improving users’ health and wellbeing and reducing social isolation. There are currently a range of groups for children and young people running weekly at the library, including Leasowe Bookworms (for children aged 6-12, Mondays and Fridays) and Frank’s visit is sure to be an unforgettable treat for all ages. Tickets are free to this special event but booking is essential. To book your place, please contact Leasowe Library on leasowelibrary@wirral.gov.uk, call 0151 638 4013 or drop into the library.